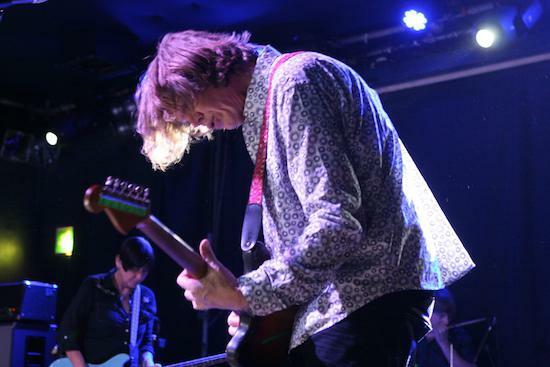 Having followed the Thurston Moore Group from their earliest shows at Café Oto in August 2014, it’s been a pleasure to observe the ongoing evolution of the musician's post Sonic Youth persona. It's now way beyond finding its feet, and currently drawing strength through the confidence of its stride, as epitomised by the glorious new record, Rock N Roll Consciousness. A lot of this material remains fairly close to late period Sonic Youth, although with a cleaner guitar sound and a little more emphasis on the Krautrock element. This is after all, what Moore does best, despite all the other irons he always seems to have in the fire. As is fitting of someone with such a lengthy and passionately felt career, Moore comfortably straddles disparate genres, demonstrating with his more experimental urges, the ability to step into an improvising group at places like Café Oto and keep pace with free jazz luminaries such as Daniel Carter, or highly versatile, high technique rhythm sections well versed in the free flow of in-the-moment ideas, like that of drummer, Steve Noble, and double bassist, John Edwards, to name but a few. The Thurston Moore Group, however, is where his true talent for ‘no wave rock and roll’, as he himself would have it, really shines. James Sedwards and Moore have developed a wonderful rapport in their relatively short time playing together. 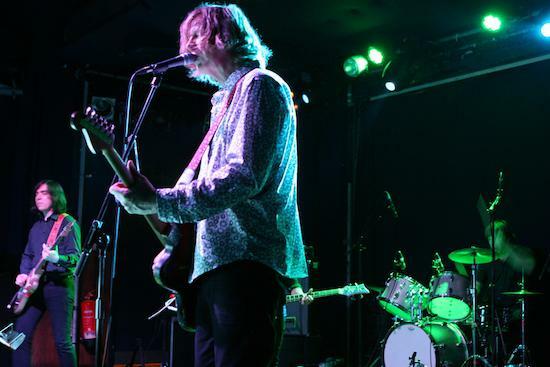 Their clean sounding intertwined guitars, at times reminiscent of the twin guitar attack of Television’s Tom Verlaine and Richard Lloyd, conjure a pretty, propulsive kind of dissonance between them. Sedwards’ classic rock mode soloing forms a perfect counterpoint to Moore’s ecstatic, perfectly controlled squalls of feedback and percussive string shredding. There’s a clear line of evolution from Moore’s early days copping experimental guitar techniques from Glenn Branca’s guitar orchestras, through the first Sonic Youth records to the melodic, yet still noise informed, technique he deploys here and it’s a wonderful and truly unique thing to behold. The impeccable rhythm section of Debbie Googe on bass and fellow Sonic Youth, Steve Shelley, on drums provides the powerful motorik beat that drives this vehicle and makes for such a seamless synthesis of Krautrock and Americana. The last time I saw the band perform, English drummer Cheb Nettles, currently active in the present incarnation of space rock band, Gong, sat in as a replacement for Shelley, giving a tantalising glimpse into still another dimension that this group could take, in the form of more experimental freeform interludes in between songs. Although in some ways not as versatile a player, who seems less comfortable with extended improvisation, Steve Shelley’s metronomic drumming is the heartbeat of this band, and the fans are happy to have him back. The first song starts, typically slow building, Moore’s ringing guitar note echoing out across the heads of the crowd. ‘Ceasefire’ kicks in, Googe’s bass like a punch in the ribs. The sound though, as is often the case at the Scala, isn’t great. Indistinct in parts, guitars not loud enough, Moore’s voice getting lost at times. Despite some occasions when the subpar sound at the Scala renders it elusive in the mix, Moore’s vocal still manages to come across as the effortlessly iconic thing it is. Laid back yet elated, with just the right amount of drawl, warm yet melancholy at the same time and conveying a certain degree of longing, with an edge of clear romanticism, it’s a voice that many of those present have grown up with over several decades. ‘Turn On’ is introduced as ‘a song about being in love in London in the 21st Century.’ Having married in February but only this week being reunited with my American wife after a lengthy wait for visa processing, it’s a sentiment that really resonates in our corner of the room. An interlude follows, filled with sounds like massive strings being stretched out towards infinity. The percussion mallets come out and Shelley begins to hammer out a groove; a low thunderous rumble you can feel in your guts. I realise I’m getting thirsty again as I reach the end of my can of beer, when I get a tap on the shoulder and the Canadian guy and his girlfriend standing behind my wife and I has bought us both a drink. ‘I read what you were writing on your phone over your shoulder and liked it so much, I thought I’d buy you a beer,’ he says. Which is, frankly, one of the best responses I’ve ever got to taking notes at a concert, some of which have bordered on the outright offensive. The final encore, ‘Ono Soul’ from Psychic Hearts, ends the evening on a ecstatic note. Moore tuning/detuning his guitar strings. Again that gorgeous, dry (like the desert) guitar sound coupled with Googe and Shelley’s compelling Krautrock chug. An extended improvised section in the middle deconstructs the tune before putting it all back together again as the band return to the main riff. Moore intones: ‘Bow down to the queen of noise/Crayon eyes draw/Boys blood pour some of Patti’s wine/Blood is love inside.’ Despite the inadequacies of the venue’s sound, made all the more apparent when held in comparison to their last Café Oto show, the noise so fierce when contained in that small space, it’s a fitting end to a sublime evening.